As potential science experiments go, a massive oil spill resulting in severe environmental and economic damage isn't anyone's idea of a good field test. But while the more than 4 million bbl. of oil spilled into the Gulf of Mexico after the sinking of BP's Deepwater Horizon rig last April mucked up coastlines and caused tens of billions of dollars' worth of damage to the Gulf Coast economy, it also gave scientists an unprecedented chance to examine how a major water system would respond to all those hydrocarbons. What would happen to the methane and other chemicals released with the crude? Where would the oil go? The National Science Foundation hoped to answer these questions, fast-tracking grants to eager marine scientists who organized field trips to the Gulf while the oil was still flowing in May and June and then followed up once the spill was capped. 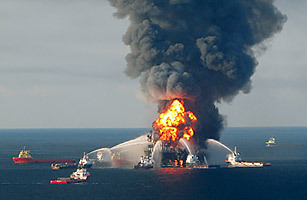 While the jury is still out, the early evidence shows something surprising: the Gulf proved to be much more resilient to the oil spill than scientists might have expected. The vast majority of the oil and other hydrocarbons seem to be gone, less than six months after the crude stopped flowing. And the biggest heroes of the cleanup turned out to be not the thousands of workers who scoured oil from the beaches or the shrimp-boat captains who turned their vessels into oil skimmers. They were actually the microscopic bacteria in the Gulf that digested much of the hydrocarbons while they were still deep under the surface. "This has really helped us understand the capacity of a natural system to handle this kind of event by itself," says John Kessler, a chemical oceanographer at Texas A&M University. "And it sort of does handle it." But when Kessler and Valentine organized follow-up sampling trips in August, September and early October, they found something shocking: the methane had largely disappeared. Working aboard the National Oceanic and Atmospheric Administration research vessel Pisces, the scientists used sensors at 207 locations in an area of the Gulf larger than the state of Maine and found virtually no methane. That doesn't mean they found no sign that the hydrocarbon had been there — there were huge patches of water depleted of oxygen, evidence of action by bacteria, which use oxygen when consuming methane. "The only explanation for that large an amount of oxygen loss is methane consumption by bacteria," says Kessler. "But it's very surprising it happened so fast, with such large quantities." Further confirming that it was microorganisms that did the mopping up, Valentine and Kessler also found genetic fragments of methanotrophs (bacteria that feed off methane) and DNA evidence of an enzyme used to break down methane. See more Going Green coverage. See a click-through of the world's worst oil spills. Bacteria also seem to have taken care of much of the oil that was released in the spill. During July and August, researchers at the Lawrence Berkeley National Laboratory took nearly 200 samples of Gulf water, following the likely dispersal path of the oil, but couldn't find any Macondo crude. While there had been concerns earlier in the summer that large underwater plumes of oil might remain intact, researchers at the Woods Hole Marine Biological Laboratory haven't found much underwater oil since the spill was stopped. And a federal report released in November estimated that at most 22% of the oil spilled into the Gulf might still remain in the waters and that bacteria had likely broken most of that remainder down. As scientists keep examining the Gulf, it may turn out that even if the ecosystem isn't perfect, it's much more resilient than expected. Part of that is not just biochemistry but luck. The relatively warm waters of the Gulf — and the fact that the spill took place more than 40 miles (65 km) out to sea — gave the bacteria the time and environment they needed to consume hydrocarbons. (Alaska's Prince William Sound, by contrast, has no natural oil seeps that would support crude-eating bacteria, so there were none around capable of breaking down oil after the Exxon Valdez spill.) The research done on the Gulf will help scientists develop better bioremediation techniques to clean up the next major spill — because you can't always count on nature to heal itself.